Last weekend an exciting retail store opened in Sydney, Australia. The Cruelty Free Shop opened its doors for the first time, with a queue of customers waiting outside! People came from all over town, some travelling an hour or two, to check out this pioneering store which stocks only 100% vegan products. The Cruelty Free Shop has existed online for over 10 years. They stock a large variety of vegan goodies available both online and at their new retail premises. Vegan cookbooks, vegan sweets, vegan mock meats, veagn ice-cream, vegan make-up, pantry items, cleaning products and bath and body products are just some of the products you will find there. 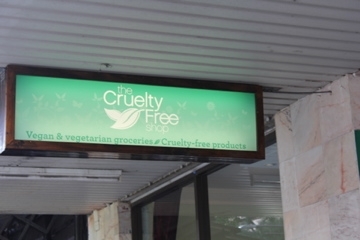 If you live in or near Sydney, I definitely recommend a trip to check out The Cruelty Free Shop. In addition to their large range of vegan products, they also have very friendly staff happy to answer any questions you might have.